A: In 2002, a study was undertaken at the request of the New Jersey Department of Transportation (NJDOT). 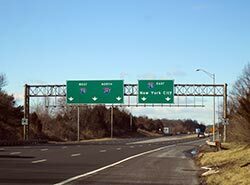 This study found complex traffic patterns and high traffic volumes led to frequent traffic congestion and crashes on the left side entry ramp from I-78 eastbound to I-287 northbound (Ramp H). It also found a higher than normal crash rate for the Exit 22A ramp from I-287 northbound to Routes 202/206 southbound (Ramp SA) due to queuing onto the I-287 northbound auxiliary lane during morning and evening rush hour. The proposed improvements were designed to improve safety, reduce congestion and weaving in this area. The project is anticipated to begin construction in the fall of 2016. Construction is anticipated to be completed in the winter of 2019. Q. How will travel be impacted? A: All traffic lanes will remain open along I-287, I-78 and Routes 202/206 during peak hours. Off-peak hour lane closures, including overnight hours will be employed to perform construction not otherwise possible under fully open traffic lanes. Traffic slowdowns on the highways and ramps will be required during overnight hours for erection and removal of bridge girders and overhead sign structures. During the tie-in of the existing ramp from I-78 eastbound to I-287 northbound (Ramp H) with the planned new Ramp H, the existing ramp will need to be closed either over a long weekend or for a couple of nights. During such closures, I-78 eastbound traffic destined to I-287 northbound will be diverted to an unused loop ramp, which will be temporarily reopened for the detour. Q. Does NJDOT plan to widen the travel lanes? A: Yes. I-287 northbound will be widened to accommodate the new Ramp E, which will be connecting I-287 northbound to I-78 eastbound. The ramp from I-78 eastbound to I-287 southbound (Ramp B) will receive minor widening. Routes 202/206 will also receive widening to accommodate an auxiliary lane from the ramp from I-287 northbound to Routes 202/206 southbound (Ramp SA) onto Routes 202/206. Q. How much will it cost and who will pay for it? A: The project cost is estimated to be $24.5 million and is federally funded. Q. How can I stay informed or offer suggestions? A: Check this web site regularly for updated information. Q. What if I have other questions or concerns about the project?